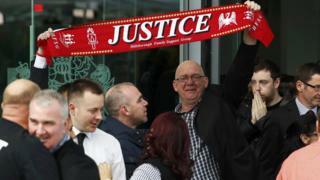 Families of football fans who died in the Hillsborough disaster are pursuing High Court misconduct action against the South Yorkshire and West Midlands police forces, lawyers have said. The inquests jury found the 96 victims were unlawfully killed and there were police failings. Families have lodged claims of misfeasance in public office, said Saunders Law Solicitors. Legal action began in 2015 but was suspended pending the conclusions. South Yorkshire Police is yet to comment. West Midlands Police confirmed the force was aware of the proceedings. Deputy Chief Constable Louisa Rolfe said: "Our thoughts remain with the family and friends of loved ones who died and were injured in the Hillsborough tragedy. We recognise the impact the inquests have brought upon them." After a 27-year campaign by victims' families, the inquests jury found match commander Ch Supt David Duckenfield was "responsible for manslaughter by gross negligence" due to a breach of his duty of care. Police errors added to a dangerous situation at the FA Cup semi-final at which the fans died, jurors concluded on Tuesday. Misfeasance in public office is a civil action against the holder of a public office, alleging that the office-holder has misused or abused his or her power. The action relates to the events on the 15 April 1989 and the aftermath. Several hundred clients were bringing the claim "in an effort to secure accountability", lawyers said. Sheila Coleman from the Hillsborough Justice Campaign said: "It is an indictment on our society that the only way to bring people in power to account is to hit them where it hurts. "It has been a rollercoaster since Tuesday. We are all a bit confused and elated. There is a whole range emotions. There is a lot of elation and anger." Pete Weatherby QC, who represented some of the victims' families, said: "Of the families that I represent, there is nothing further from their minds at the moment than the pursuit of money. This is a struggle by bereaved families, victims, for truth and justice and the end to impunity. "And right in the middle they have had a famous, iconic victory in the inquests. But they are still very much in the middle of that struggle." South Yorkshire Police was in charge of planning and operational duties on the day of the disaster. West Midlands Police was brought in to carry out the original investigation into the conduct of officers. A statement on behalf of Saunders Legal team said there was evidence of "the systematic cover-up intended to transfer the blame for what happened from South Yorkshire Police to the innocent, by spreading lies, doctoring evidence, pressurising witnesses and suppressing the truth". The evidence points to "abuse on an industrial scale" by both South Yorkshire and West Midlands Police, beyond any "one bad apple" analysis, it added. South Yorkshire Police had spent millions of pounds of taxpayers' money "defending the indefensible", it said, adding that "the evidence suggested institutional misfeasance by the two forces against fans". A budget report, published in June 2015, said the force's legal fees had reached £14m with the "potential for further significant costs" as the hearings continued. South Yorkshire Police's current chief constable David Crompton was suspended on Wednesday because of the approach the force took to the inquest. In 2012, Mr Crompton admitted "grave errors" were made during the Hillsborough disaster and has apologised "profoundly". On Tuesday after the inquests conclusions were delivered, he admitted the policing of the match was "catastrophically wrong" and "unequivocally" accepted the findings. Hillsborough families have expressed anger after retired South Yorkshire police officers were told to be proud of their work, despite the inquests' conclusions. A message on a website for the force's retired officers said they had served dedicated and courageous careers. Families of those who died have called for criminal prosecutions to follow the hearings. Two continuing investigations into the disaster and its aftermath could finish by the end of this year. A police inquiry, Operation Resolve, is looking at the lead-up to the crush on the day of the match, while a separate inquiry by the IPCC is investigating allegations of a cover-up.